The Cambrian Photography Show, an annual event put on by Cambrian Photography Colwyn Bay North Wales was a big success all round. It was a very busy all day and the morning was like the first day of the Next Sales ! I was invited by Sarah Jones to talk about my Year of Black and White and also my use of Fuji cameras. I was quite surprised that both my talks were sold out well before the event although Sarah managed to sneak a few more people in. The event went very well with Tim Wallace giving up his time to give a two hour seminar at Oriel Colwin. Whilst Tim is was being paid for appearing, in the time he has known Sarah, he has been so taken by Sarah’s passion for helping those in need, through The King’s Storehouse Food Bank, that he wanted to help in some way. Tim is also very keen to give back to the photography community, Sarah mentioned Lightbox the Young People’s Camera Group that Paul Sampson from Oriel Colwyn runs. This has led to Tim requesting that the price of entry be donated to both of these great organisations to help them do more and help more. I spoke to Tim after the event and he was very happy with how the whole day went and wants people to still donate if they can, and you can DONATE on this page for a while yet. It’s no secret that I am a Fuji evangelist following my journey from Nikon to Fuji so most of the day was taken up with people wanting to know why I changed. Fuji had a great day at the show with amazing interest photographers from all fields, I know for a fact some of the other manufactures are even a little jealous of Fuji and there amazing lens road map. 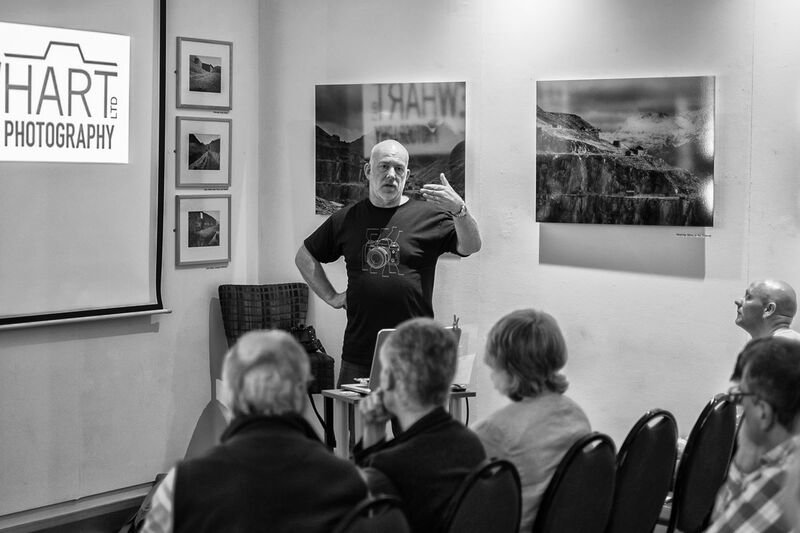 The part of my talk that people most mentioned afterwards was my passion for the Fuji brand, and this was echoed in people coming out of my talk and buying the cameras, there is a growing trend of people selling their DSLR for the amazing Fuji X-T1. I said in my talk that the Fuji XPro1 is like my Nikon Fm2, I used my Nikon Fm2 for over 11 years and it became my go to work horse camera, most of the time I just used it with the 50mm lens. Well now my go to street camera in the Fuji XPro1 and the 35mm lens lives on this amazing Fuji body. The Fuji X-T1 is stunning, before I moved to Fuji I used to shoot with the Nikon D3s and all pro glass, now I shoot with the Fuji X-T1 and the amazing lenses! I have recently not been able to take the Fuji 10-24mm lens off my X-T1 and every one that has tried my lens has gone out and bought one! To say this lens is stunning is an understatement! One of my favorite Nikon lenses was the 14-24mm but this lens was let down by the fact it could not take filters without a stand-alone system and the fact it would flair as soon as you shot it outside. The Fuji 10-24mm lens is by far the best wide Zoom I have ever used and it takes filters! It also has image stabilization! It’s as sharp as pins and is light and easy to carry around. I am passionate about Fuji and the future lens road map is stunning, I can’t wait for the Fuji 50-140 f2.8mm Zoom and the Fuji 16-55 f2.8 Zoom if the 10-24mm is anything to go buy these will be world class stunning optics. I am so passionate about Fuji that I started the Fujiholics social media groups where I try and spend some time when I am not out shooting or editing. Please feel free to come along and say hi, the groups are on Twiter, G+, Facebook and Instagram so keep your eyes open as we try to bring you information on Fuji events and product launches. I would like to say that one of my main reasons to move over to Fuji is the passion of the Fuji team and the way the Fuji cameras allow me to control every function and not leave it to the camera. The cameras are stunning and have a great range of functions, but the fact I can control all the functions I need from the outside makes these cameras incredibly photographer friendly. I have slowly watched over the course as more and more Pro Photographers picking up and using the Fuji range. For me the XPro1 and the X100 were the game changers. But the X-T1 has taken this all to another level. I would like to thank Sarah for inviting me to the show and Fuji for inspiring me to shoot every day of the week. There are still a few places on my Liverpool Photo Walk so sign up quick before the weekend closing date. One life, Capture it .. This entry was posted in Uncategorized and tagged Cambrian, Fuji, Fujifilm, matt6t6, North, Packed, photography, Photowalk, Show, Talk, Wales, X-T1, XPro1, Year of Black and White.